China’s stock market crash: Heading for a great leap backwards? 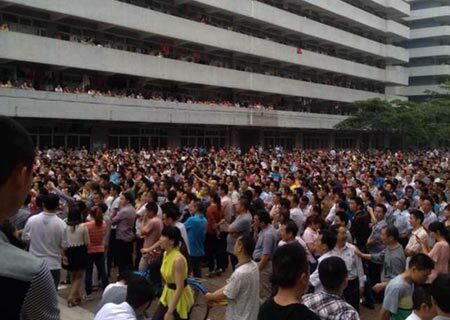 Class polarisation: 30,000 workers on strike at China’s biggest shoe factory in 2014. In 20 years, China has gone from the most equal country in Asia in terms of income distribution to the least equal country. While the transformation has proven profitable for a minority, tens of thousands of workers have taken strike action against paltry wages and conditions. This restructuring has also meant increased vulnerability to fluctuations in the stock market. In a piece originally published at Green Left Weekly (Australia), John Rainford examines the context of the recent stock market crash in China. Australia managed its way through the Global Financial Crisis (GFC) in better shape than most countries, mostly due to two factors. The first was $83 billion in Australian government stimulus spending, the third largest in the world as a percentage of GDP, behind the US and South Korea. The second was resilient demand for iron ore and coal exports to China which came from an initial US$4 trillion in Chinese stimulus spending organised through the country’s banks. This Keynesian counter-cyclical deficit spending led to China also being relatively unaffected by the GFC from its onset in 2008. But much of the cheap debt available in China was funnelled into property and share market speculation. This created a dual bubble that was always going to burst at some point. In the year from June 2014, the Chinese stock market value rose by 100%. But in just three weeks from late June, the stock market lost a quarter of this value, wiping out $2.4 trillion of investor’s money and affecting financial markets around the globe. China’s rise to a leading world economic power has been meteoric. It can be dated from 1978 when the Chinese Communist Party leadership under Deng Xiaoping (referred to by Mao Zedong as a secret “capitalist roader” during the Cultural Revolution of 1966-76) announced a program of economic reform. This involved “four modernisations” in agriculture, industry, education, and science and defence. These were designed to introduce market forces to the Chinese economy. Fortuitously for China’s leader’s ambition, the turn to neoliberalism in the rich countries from the 1980s opened up the opportunity for China to become incorporated into the global market. This allowed China to develop a peculiar form of market economy that was variously controlled or manipulated by a state still claiming to be socialist. “Socialism with Chinese characteristics” remains the official party line. What it has delivered so far is a mixed bag of environmental degradation, social inequality, state suppression, and rampant corruption. This has come alongside spectacular economic growth, rising living standards for a significant part of the population and a burgeoning middle class who have reportedly pumped more than 10% of their new-found wealth into the Chinese stock market. China’s largely state-owned banking system, which has financed the boom, grew rapidly after the mid-1980s. In less than a decade, the number of branches of state banks went from 60,000 to 144,000, with the number of employees increasing from 974 thousand to 1.9 million. In this period, their deposits increased from 427.3 billion yuan to 2.3 trillion yuan, while total loans went from 590.5 billion yuan to 2.6 trillion yuan. This led to a property bubble forcing the Chinese government to spend almost as much to clean up bad loans as the US government did to bail out the savinsg and loans finance sector in 1987 ($124 billion). When, in 2003, the Chinese government transferred $45 billion in foreign exchange reserves to two large state banks, it was the third largest bailout of the banking system in less than six years. The Chinese government has responded to the latest stock market rout by organising market brokerages to invest in a blue-chip exchange-traded fund. This will buy shares to stem share price losses. It has also suspended any new stock market listings, raised quotas for foreigners to buy stocks, and the central bank will provide funds to encourage investors to borrow to buy shares. This unorthodox approach which appears to be analogous to throwing petrol on a fire. The vastly overvalued stock market is a result of China trying to manage a transition from the reliance on exports and infrastructure development that has sustained its phenomenal growth rates, to raising domestic consumption as a driver of growth. The country responded to the GFC by ramping up infrastructure spending. It raised its contribution to GDP growth from about 25% in the 1990s to 90% in 2009, the year it began the largest infrastructure stimulus spending in history. In the period from 2008-13, new credit available across the economy increased by more than $20 trillion, an amount larger than the size of the entire US commercial banking sector. China is also shifting from the foreign direct investment (FDI) that it relied on to sustain its rapid economic growth, to outbound direct investment (ODI). This grew at an average 19% each year between 2009-14. In 2014, ODI was $116 billion, almost on a par with FDI of $120 billion. The envious view of China’s economy held by many countries takes on a different hue when seen from the perspective of a large number of Chinese citizens. In 20 years, it has gone from the most equal country in Asia in terms of income distribution to the least equal country. According to some reports, a third of its people live on less than $2 a day. A significant amount of the capital accumulated by companies operating in China has come from not just low-paid labour but from unpaid labour. This has led to another major problem that China has to contend with — huge labour surpluses that it must either absorb or be ready to repress. This will be much more difficult in a slowing economy, and the extent of the problem can be gauged by the official figures which recorded more than 184,000 occurrences of mass unrest in 2013. The Maoist notion of the masses being made up of “workers, the peasantry, the intelligentsia and the national bourgeoisie whose interests are harmonious with each other and the state” is certainly not the case now, if it ever was. China has long been funding US debt so the US can continue to consume China’s surplus production. Should the Chinese economy fall into recession, or even enter a long period of stagnation like Japan, the fragile, jobless and anaemic recovery from the GFC in the rich world would come to a halt. The US would likely be the first country affected as it is the largest destination for Chinese investment. As to how Australia might fare: leaving aside the obvious further contraction of iron ore and coal exports, last year China became the biggest foreign investor in Australia, with $64.5 billion coming into the country in 2014. The Abbott government will be hoping that the Chinese Communist Party gets its response right.